So much fun. I could sum up yesterday with just those three words. I started the day off drinking coffee at my friend Wes’s house and writing yesterday’s post. 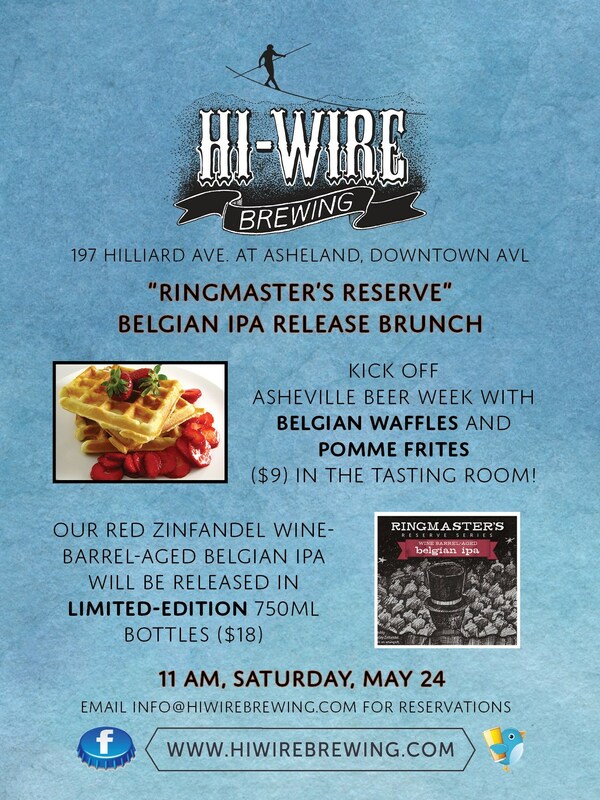 I published it hastily so I could make it to Hi-Wire Brewing’s Ringmaster’s Reserve bottle release and brunch. Luckily they had wifi, so I was able to fix all my typos and add in the hyperlinks. Today I don’t know if I’ll have that luxury. 1st event of day 2! I enjoyed the event. There wasn’t any lines and I was able to get food and my bottles pretty easily. I sat down and enjoyed washing down my waffle covered in mango chutney with the belgian ipa. I could have stayed for hours, but it was time to meet up with Wes, Aaron, Rob and Das Krewe at Wedge Brewing for Just Economics Just Brew It homebrew festival. Rob and I helped Wes pour his Scotchy Scotch Scotch Butterscotch Scotch ale and his Balls A’ Fire Cinnamon beer. Wes had made up his own infusion contraptions where the beer was poured through funnels full of butterscotch or red hot candies. By themselves, the infusions were a little to much, so we quickly settled on telling people to try the beer on it’s own and then to add a shot of the infusion. That seemed to be the magic combination, and Wes got many compliments on the brews. 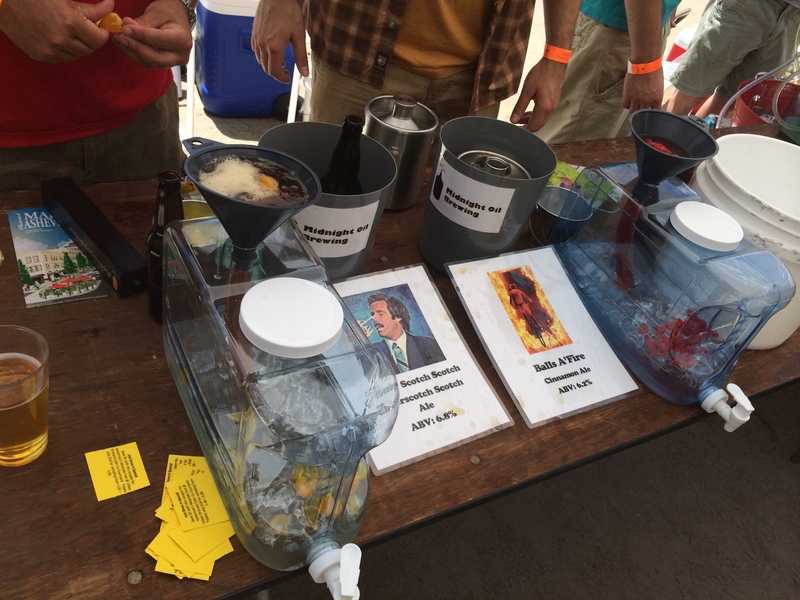 The best part of this festival was the creativity of the homebrewers. The recipes, the beer names, the signs were amazing. 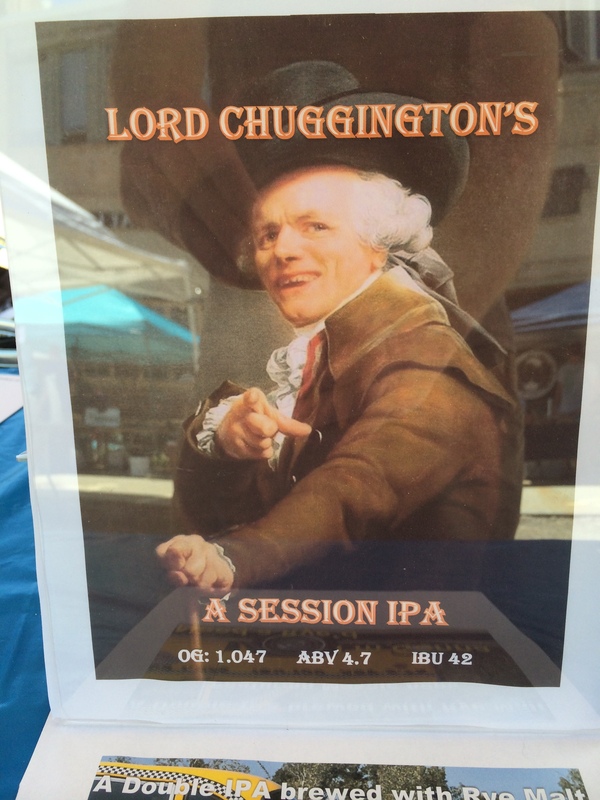 My favorite beer, name and sign of the fest belonged to Jay Love who brewed a session IPA called Lord Chugginton’s. I liked it so much I told him that I wanted to buy the name and recipe from him. He did give me his awesome sign for it. As the festival proceeded in the dusty parking lot behind Wedge, Rob kept going to the brewery and buying us full beers. Here we were surrounded by free beer, yet he wanted full pints. Who am I to argue with the concept of that? At the end of the festival it was awards time. Wes won a trophy for most creative for his Scotchy Scotch Scotch! I was tired from being in the sun, and had sobered up, so I drove back to Wes’s house for a quick nap, a shower and a change of clothes. I needed to rally for the night! I had met so many cool people and made plans to hang out with friends old and new. 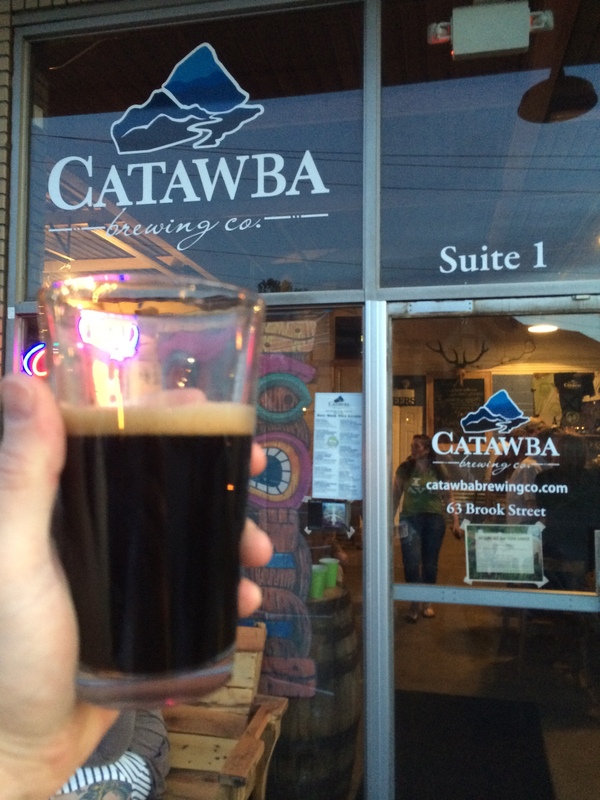 After I felt refreshed, I headed over to Catabwa’s new brewery in Asheville where I met up with my people. It was a release party for their seasonal King Coconut. I arrived to a table full of my friends and absolutely covered in pitchers of beer. They even had a glass waiting for me. After a few rounds we made plans to take the party back downtown. Some of our group wanted to hit up French Broad Chocolate Lounge, while others wanted to go anywhere else. Wes and I parked over in the South slope brewery district and dipped into Twin Leaf Brewery for a half pour. It was my first time checking them out. Really nice place with a great selection. While there I ran into my buddy Pete who currently works for Olde Hickory brewing. After Twin Leaf we headed towards Wicked Weed where there was another crazy long line. We headed towards Thirsty Monk but never made it that far. We stumbled across a new brewery I hadn’t heard of before called One World Brewing. We had to check it out! We got our first drink when the rest of Das Krewe made it over to join us. I didn’t really hang with my friends because flirting upstairs with a girl I just met became my priority. Her name was Carmen, and she worked there. Before I knew it, it was getting really late and everyone was ready to call it a night. I wasn’t ready to leave, and certainly knew I shouldn’t be driving. Wes had started sobering up over the last hour or so and took the keys and got us safely back to his place in South Asheville. So what’s on the agenda today? I’m going to the bottle release at Wicked Weed. Then it’s WESTSIDE FEST! I’m running the randal during this and am looking forward to it. What else will the day have in store? More drinking, more flirting and lots and lots of fun. You can follow along on my twitter, untappd and instagram. Also make sure to follow Asheville Beer Week on those same social media outlets as well as Facebook. A big shout out to Asheville Ale Trail as well. Check out the pictures below. See y’all around town. Rob kept buying rounds. Great guy! 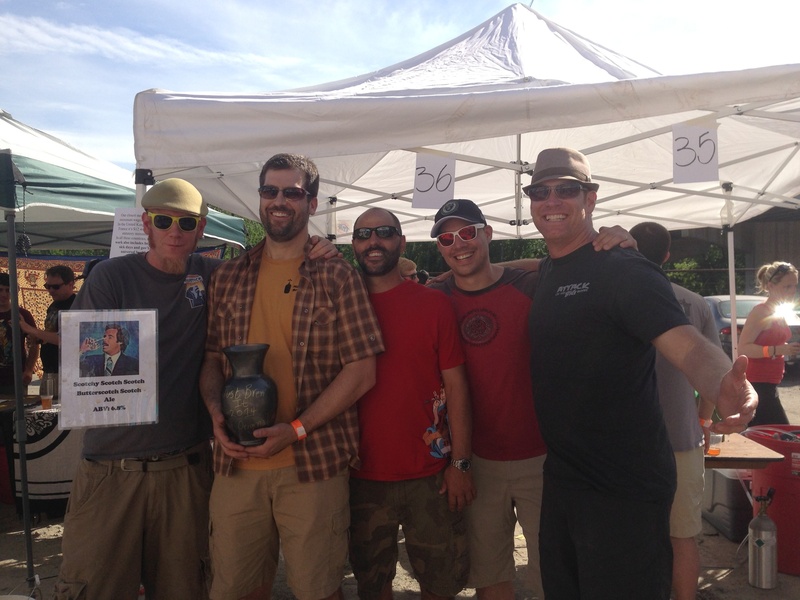 This entry was posted on Sunday, May 25th, 2014 at 10:54 and is filed under #AvlBeer, Asheville, Asheville Beer Week, Asheville beercation, Asheville Brewing Company, drinking, Social Media. You can follow any responses to this entry through the RSS 2.0 feed. You can leave a response, or trackback from your own site.